Escape the 'snapshot photo' copycat trap! Learn ways to bring four footed family members to life. 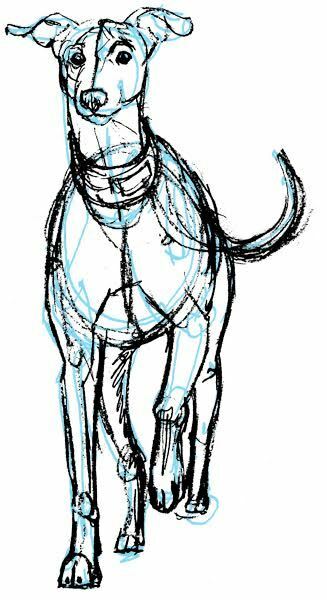 Learn to 'Look' at the figure, see beneath the skin and fur to make the skeleton armature, muscles and fur work together to make shapes. Draw without relying on those very addictive photo references. Outcomes will be loose study size. The pages used never bigger than 8.5" x 11", usually less. Nola is a signing member of the Toronto Watercolour Society, an associate of the Canadian Society of Painters in Watercolour, also The Colored Pencil Society of America and the East York Garden Club. She creates the Banbury Brief, a weekly review from The Banbury Studio. Along the way she's led workshops, had exhibitions and won a few awards. On her first sale in 1967, a graphite image drawn from life of an elderly horse, she made her career choice, professional visual artist. Since that date she has balanced her fine art career between examinations of Muskoka's natural shorelines and domestic animals of all sorts. After graduating from the Ontario College of Arts in 1974, she imagined, built and installed seasonal décor for major retail chains and shopping centers. She was Santa's elf designer for his homes across Canada. In 1996, her love of teaching and drawing led to the adult teaching certification, an AESTC.